Contributing to the devastation of the opioid crisis is the arrival of the extremely potent—and deadly—man-made drug fentanyl. Fentanyl’s propensity to kill comes from it’s extreme strength. 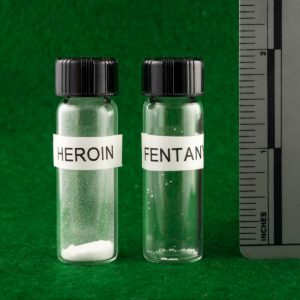 According to the Centers for Disease Control & Prevention (CDC) fentanyl is 50 times stronger than heroin and 100 times stronger than morphine. A lethal dose of heroine is about 30 milligrams, while a mere 3 milligrams of fentanyl can take a life. In the healthcare field fentanyl is combined with other medication for anesthesia, and used alone to treat severe post-surgery or cancer pain. Fentanyl is used by injection, patch and lozenge. As with other opioid class drugs it works on nerve cells in the body reducing pain and causing a sense of euphoria. Unlike heroin or morphine, fentanyl is synthetic rather than derived from the sap of poppy plants. It also works much quicker and is harder to counteract. Some of the fentanyl supply available illegally is diverted, or stolen, from medical facilities and pharmacies. The vast majority of fentanyl sold illegally is produced in unregulated, illicit labs. With the potential to make fortunes, illegally produced fentanyl floods the streets of our towns and cities. Criminals use illegal labs in China to create and sell the powder, which drug cartels around the world mix with other drugs and form into pills. The pills are then sold on the black market as pain or anxiety medication or mixed in bags and sold as pure heroin or cocaine. These illicit drugs have unregulated amounts of fentanyl which can prove deadly. According to the Drug Enforcement Agency (DEA) drug traffickers can make $1.5 million dollars on products made from one kilogram of illicit fentanyl. For addicts, the risk of drug use is upped greatly because they do not know the content of substances they are putting in their bodies. The clandestine labs producing fentanyl knock-off variations crank out product, not knowing how those products affect the body. Lacking the precise equipment of the medical field drug traffickers risk creating pills and powders that will cause overdose. An overdose can come just seconds after use, leaving very little time for CPR or other counteractive measures. In Massachusetts, deaths related to fentanyl increased dramatically, from 57 percent in 2015 to 75 percent in 2017. Traces of illicitly produced fentanyl show up in all kinds of drugs. Neighborhoods across all geographic, racial and socioeconomic boundaries feel the pain and loss. From musicians Prince & Tom Petty to neighbors and friends, lives are lost every day to fentanyl.